Three Lower Mainland director positions are up for election during this year's Annual General Meeting, each with three-year terms. Voting will take place online with polls opening on January 11, and closing at 4pm on January 25, 2017. Click here to view their candidate statements and videos. 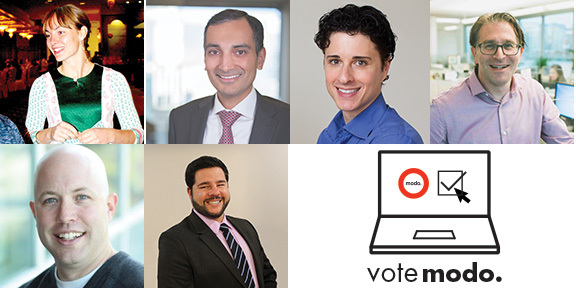 All shareholding Modo members in good standing by December 10, 2016 are eligible to vote. Voting starts January 11, 2017—eligible members will be notified by email when polls are open. Come to our Annual General Meeting! Tips From Our Pros: Book a Modo close to transit! NEW LOCATION at Vic West Community Centre: There's now a 2017 grey Toyota RAV4 Hybrid (#861) in the parking lot just south of Vic West Community Centre, between the tennis courts and Chicken on the Run, at Craigflower Road & Raynor Avenue. Thanks to member, Elizabeth for helping transport our new vehicle from the Mainland! THIRD CAR at Vista Point: A 2017 red Kia Soul (#843) joins the Fiat 500 and Ram Promaster across from 5828 Thunderbird Boulevard. NEW LOCATION at Magnolia House: A 2017 white Toyota RAV4 Hybrid (#863) now lives in a designated stall next to 3565 Wesbrook Mall (Magnolia House), between Ross Drive and Gray Avenue. NEW LOCATION at InGastown: A 2016 white Honda Fit (#855) and a 2016 blue Toyota RAV4 Hybrid (#822) now live behind 150 East Cordova Street, just west of Main Street, in the lane between Hastings & Cordova. UPGRADE at Avalon: A 2016 grey Honda Fit (#853) has replaced the 2011 Mazda 2. UPGRADE at W 10th & Hemlock: A 2016 red Honda Fit (#856) has replaced the 2012 Mazda 2. UPGRADE at Napier: A 2016 white Honda Fit (#849) has replaced the 2011 Mazda 2. 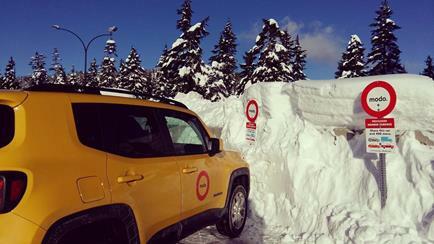 Recently, a member asked about Modo cars that are close to transit stations. We've made finding a Modo close to transit easy when you use our Search Filters! New locations and parking spots are often secured by our team members on the road. 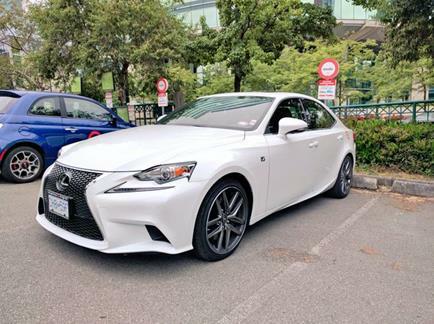 Members enjoy parking privileges throughout the City of Victoria, as well as some exclusive locations in the Lower Mainland, and we want to make sure you know about your parking perks before you hit the road. 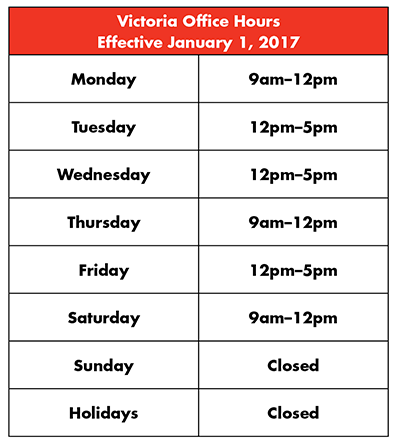 Effective January 1, 2017, our Fort Street office will extend its hours to better serve our members' schedules. Click here to read more. Did you know you can earn $25 free driving every time you refer a new Modo member? Take our Quick Poll to learn more. >> MODO TO TOFINO Member Chris shared his kind feedback with us—and a great snap from Tofino! >> WINTER TIRES Modo's Director of Fleet Operations has some advice on booking the right, winterized Modo for your trip to the mountains! >> POP OVER Heading to Nanaimo or Campbell River? Share your empty seats with other Pop members and save money. >> LOCAL CHOICE Ambassador Heidi Kuhn shared some favourite local shopping tips and her own market fun with Modo, during her Instagram Takeover in December. >> KEEP IT TIDY Our Fleet Team cleans our vehicles regularly but they appreciate a helping hand—and you can clean up on some free drive time. >>MULTI-MODAL Streetfilms put together this video on Vancouver's multi-modal transportation story. >> STAY THE NIGHT We've lowered our overnight rates until March 31st so it's easier for you to get your after-work errands done.